Little-Known Lawmaker Upsets GOP's Senate Plans In Nebraska : It's All Politics Republican voters in Nebraska defied the expectations of pundits and the intentions of outside groups, nominating a little-known rancher and state lawmaker to run for an open U.S. Senate seat. 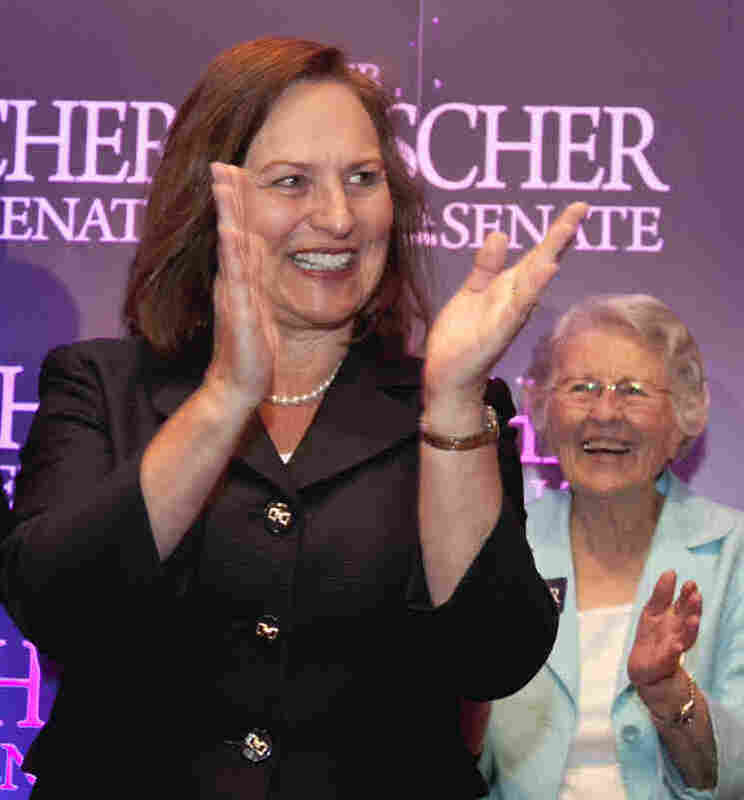 Deb Fischer, 61, will face a former governor and former senator, Democrat Bob Kerrey, in November. Nebraska state Sen. Deb Fischer applauds supporters at her election party Tuesday in Lincoln, Neb. At right is Fischer's mother, Florence Strobel. Republican voters in Nebraska on Tuesday defied the expectations of pundits and the intentions of outside groups, nominating a heretofore little-known rancher and state lawmaker to run for the U.S. Senate seat being vacated by incumbent Democrat Ben Nelson. Deb Fischer, 61, rode a last-minute surge in support to defeat the establishment-favored candidate, Nebraska Attorney General Jon Bruning. In the November general election, she will face a former governor and former senator — Bob Kerrey — who easily won the Democratic nomination. Fischer had lagged behind Bruning and state Treasurer Don Stenberg in the polls and in fundraising for the race. But her candidacy caught fire going into the campaign's final days, after receiving an endorsement from Sarah Palin. Fischer also benefited from a $200,000 ad buy last weekend from a superPAC led by Omaha businessman Joe Ricketts, the founder of TD Ameritrade and co-owner of the Chicago Cubs. The ad questioned Bruning's character and financial dealings. Fischer also lucked out in her opponents' strategy. Stenberg had the support of the conservative Club for Growth and South Carolina Republican Sen. Jim DeMint's Senate Conservatives Fund, both of which also launched a string of negative attack ads against Bruning, who had a wide lead in the polls throughout the campaign. But rather than aid Stenberg, the ads ultimately helped Fischer, who largely remained above the fray. In a statement on her Facebook page, Palin — the former Alaska governor and 2008 Republican vice presidential candidate — said Fischer as recently as a week ago had been "dismissed by the establishment. Why? Because she is not part of the good old boys' permanent political class." Palin said: "The message from the people of Nebraska is simple and powerful: America is looking for real change in Washington, and commonsense conservatives like Deb Fischer represent that change." Now Fischer faces Kerrey, an experienced campaigner, who has won three statewide races in Nebraska, but who also has been absent from the state for the past 12 years, after he moved to New York City to take the presidency of The New School. In remarks Tuesday night, Fischer made clear she intends to make Kerrey's residency an issue in the general election, saying: "We need somebody who's different. Somebody's who's tough. Somebody who's a Nebraskan." Fischer has been a member of Nebraska's unique unicameral Legislature since 2004, focusing largely on education issues. Her only other political experience was a stint on the local school board.